Travel day - from there to here. Late this morning we pack up, me carefully folding and packing my bag, Joel chucking a mountain of stuff into his bag in one minute - so many mother and son cameos in this trip. We feasted breakfast at our favourite tapas bar, spoilt for choice, before collecting our hire car. 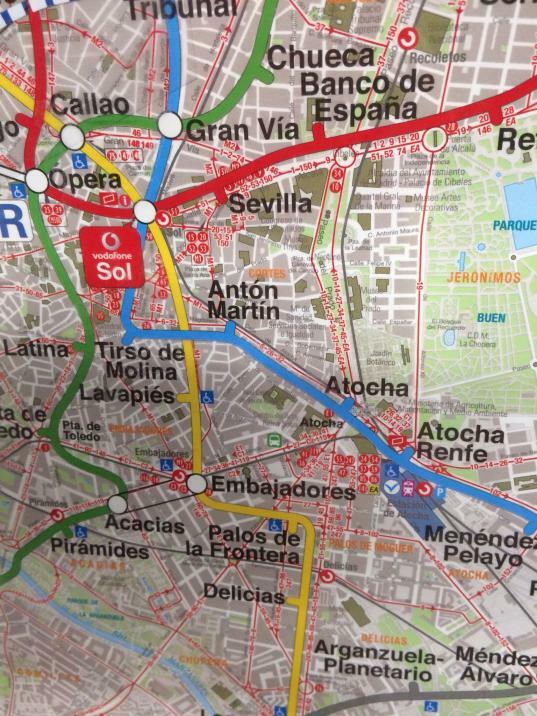 Barcelona, via Valencia to Madrid is pretty much half the country and about 6-7 hours along 120km hour freeways. We slipped into a seaside village for lunch and walked the paved beachfront promenade up to the small marina and feasted on gazpacho (cold vegetable soup) and garlic mussels. Oh my. Oh oh my. Under the umbrella shade, on the edge of the Mediterranean Sea, Spanish families around eating and talking. I am beyond blessed. So much of Spain we saw, and it kept changing. From barren rocky land, steep mountains topped with castle-fortresses guarding the surrounds to fertile plains of green. We cut through mountains on huge curved bridges, through tunnels, completely across a spectacular dam of blue water hidden in valleys, and rows of olives, citrus, tomatoes, stone fruit and grape vines, fields of freshly cut grains, yellow husked fields with big bales of straw across them. And sunflowers, fields of sunflowers their heads all facing the same direction. Passed through a storm, intense thick raindrops making low visibility. Stopped at a lonely fuel station on a hill with a hot dry howling wind around. Saw towns in the distance, each with cathedral spires reaching up above the square homes. But no water filled rivers and no animals other than a single herd of goats. And finally Madrid, like a mirage came into view. Joel drives through the huge city to the general vicinity of our airbnb and when we park in the narrow street to orientate we find he has stopped DIRECTLY OUTSIDE our accommodation. We need to wait half hour for the key and there is a tiny bar on the corner with a big rump of cured meat, dishes of white sardines and olives on display. And wifi! So we stand at the bar and drink something nice and snack on these delicacies, some we order and another he just brings presents with a grin. But at the end there is no charge for the food. It's on the house. Our unit is tiny. It's 4 floors up a worn timber stair case, massive beams line the ceiling. There is no bending down to wash your feet in the shower, actually just turning in the shower can turn off the tap. (Discovered by accident) The towel rack is well above my head. And the windows look into the typical central courtyard of these ancient buildings. It's clean and gorgeous. And authentic without having to pretend to be. It's now 11ish pm and we drop the car off locally and catch the metro to a place to find food, and it seems most of Madrid is there sitting in the cool, around fountains and walking the lane ways. We find a place to eat, and roam the streets for a while. It's kinda grungy and real here where the locals recommended we come. . No tourist shops and McDonald's around. Not polished up for visitors. Madrid, you are looking pretty darn good and I can't wait to explore more of you !